N64 Controller Fried my N64 AC ADAPTERS! Discussion in 'Repair, Restoration, Conservation and Preservation' started by seemoremacstuff, Aug 24, 2012. Hello, just wanted to know what you guys think, I have this weird N64 controller I found today that has two analog sticks and I really wanted to try it out, but I guess I won't be able to. It is because whenever I plug in this controller it fries the AC adapter, it already destroyed two of my N64 AC adapters, and even worse now when I plug the N64 I was going to use to test out the controller fries AC adapters as well, thats 3 broken ac adapters now, and I know they worked because I tested them out prior. All was fine until this cursed controller entered my possession. :dejection: What do you guys think? I htink you can't beat the original controller so why bother trying another? As for the controller blowing the PSU.... well it could just be a coincidence. If you keep testing the controller and the PSU keeps dying, the controller is probably just getting a bad rap for a faulty wall socket or something. Try the controller in a friend's N64 in bthe friends house, or use a different wall socket, cable and power strip and see what happens. Sell it on Ebay as the 'CURSED N64 controller' with the story and pictures. First, DON'T TRY IT IN ANYMORE CONSOLES. Before ever trying this controller again in any console test it with a multimeter for shorts. Possibly (likely )has something to do with the cable being broken. There are two power lines in there, 3.3v and 5v, you should check both for shorts to the ground. The pinout is easy to find on google. Possibly an easy fix. And im not sure i read you correctly, one of your N64 also fries your AC bricks too? Without controllers in it? If thats the case, then there is a short in the console also. It certainly seems peculiar that the console has fried AC adapters, but I'm guessing that it drew slightly more current than a standard N64 controller, and an aged capacitor decided it had had enough and failed, which is why your console is still blowing adaptors. I'd crack open the console and check the capacitors (especially on the controller board) and also crack open the controller as well to be on the safe side. ...wait a second: why does that controller have 2 analog sticks? I dont see how the AC adapter would get blown.. If the pad caused more current to be drawn - surely it would be one of the regulators that would give up the ghost? Also, when there is a short on a N64, the PSU just needs disconnecting and leaving for 5 minutes to reset. Also, when there is a short on a N64, the PSU just needs disconnecting and leaving for 5 minutes to reset. If that is the case then maybe his PSUs are not fried and just need some times. In any case testing for shorts in the controller is still the first thing to do. Maybe a short in the pad, the N64 trips out the PSU and he's not left them long enough to reset. Because it's likely he'll actually get some money out of it for an official controller :wink-new:. Don't panic about the PSU's yet, if you have a gamebit crack open the power supply and check the fuse. It may not be it, as the fuse is on the Primary side of things (ie input) but worth 5 minutes just to check. ***EDIT*** Just realised someone else has mentioned this and it may not be the case as what I have said. I will leave the pic as is incase someone needs for future reference. ***2nd Edit***Had a look again and it seems the UK and Australian power supplies DO have fuses on the output! I have thinly circled them on the above pic The American power supply has a spot for a 5amp fuse (as stated on the board) but it is blank. Australian uses a SOC2500 and SOC5000 type fuselink and the UK one labels them as T2.5 and T5. Can anyone ID what type of fuses they are in the UK one? They T2.5 and T5 would most likely be the same spec as the SOC2500 and SOC5000 respectively. Hey thanks for that, I am assuming they would be just fuselinks in a different package.... I guess whatever fits! Yes I think they're just standard IC protector (fast-blow) type fuses. I wouldn't use anything else in there as there's a potential fire risk otherwise. Usually safety-critical components like these are marked with a '!' symbol in service manuals and the like. I am pretty sure they are resettable - explaining what I was describing in my above post. Probably has something similar to a Zener diode 'crowbar' circuit to disable the output during fault conditions. Pretty common with a SMPS. Surely that wouldnt take a couple of minutes to reset - unlike a resettable fuse which needs to cool to reset. Explaining the symptoms a N64 psu thats tripped out shows. 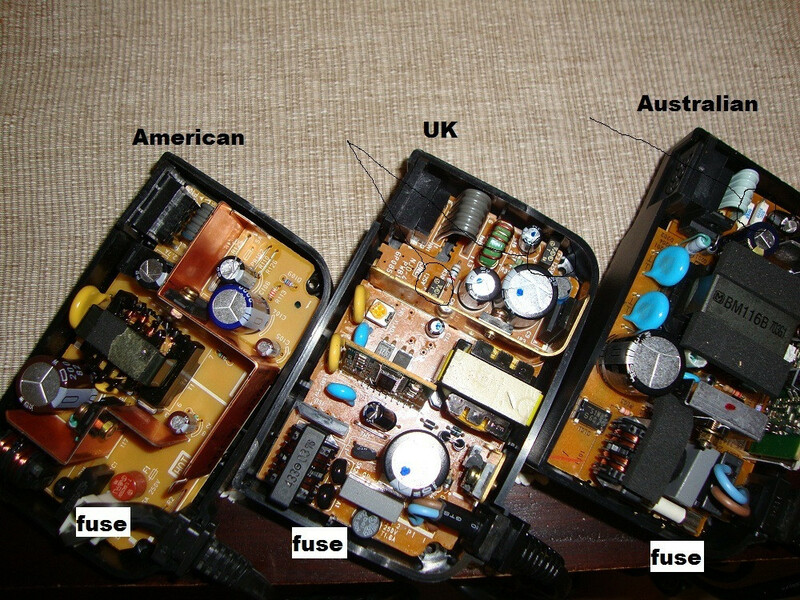 I tried to look for the data sheet for these fuses, the best I could find is the Aussie one's list it as "fuselink". So not sure if they are reset-able. If I get another "blown" one I will test for continuity over these guys. The uk one could be resetable, I can take better, close up pics if you guys like?